Who says that wild-flower photography is a sinecure ? Well the first time I saw this plant I had to climb an almost vertical slope and this with my Croc for climbing shoes ! Anyway it was well worth, what a beauty ! 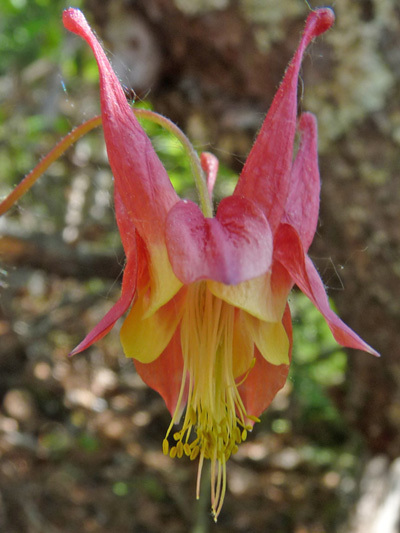 Her name, Columbine suits her very well as the spurs remind me the hat of Commedia dell'arte actors (Colombine). It's in the spurs that the nectar is located, while hummingbirds and some butterflies can reach it, some tactless insects bores the spur's end to get it.